Berlin attraction-guides.com - Berlin, Germany attractions guide Berlin Charlottenburg Palace information about attractions, Schloss Charlottenburg in Berlin Area, Germany DE, Prussian monument, history and construction, rooms, period features, Neuer FlŸgel (New Wing), King Friedrich I, furnishings and antiques, grand palace ballroom, Golden Gallery (Goldene Galerie), landscaped gardens, location and address, Luisenpl, tel / telephone number, opening hours, admission charges, and general tourist information about Berlin Charlottenburg Palace (Schloss Charlottenburg) attraction in Berlin area, Germany DE Deutschland - Last updated 30/10/2012. 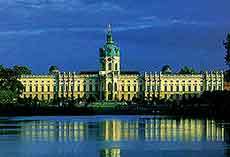 Charlottenburg Palace (Schloss Charlottenburg) is a splendid Prussian monument that serves as a real reminder of the imperial days of Berlin and still stands out as one of the most magnificent buildings in the city. Located on the outskirts of the city, Charlottenburg Palace (Schloss Charlottenburg) was originally a modest summer home to the Prussian rulers of the time and was built in 1695 and it was not finished until almost 100 years later. This palace is one of the oldest surviving Prussian palaces in Germany and Schloss Charlottenburg comprises 70 rooms, numerous corridors and consists of many different buildings, including the Altes Schloss, which is the main building with the suites of Friedrich I and his wife, and the Neuer Flügel (New Wing), where King Friedrich I once lived. There are many ornate furnishings and the west wing features a collection of ancient artifacts and also some prehistoric items of interest. This wing houses the large Golden Gallery (Goldene Galerie) which is the palace's grand ballroom and is over 42 metres / 138 feet long. The impressive gardens are also worth visiting and are open daily from dawn until dusk. Hourly guided tours to the royal apartments are available.